Every language is rich in idioms, Portuguese being not an exception. There is no shortage of idioms about food, parts of the body or about nature. Today we want to introduce you to portuguese idioms about nationality. Every day we deal with students from all around the world but what do we say about them in our language? For instance, which nationality do we associate with living extravagantly? Which one with working hard? “Viver à grande e à francesa”: luxury, luxury, luxury. People living 'at big and at French' are living ostentatiously. The origin of this expression sends us back to the first french invasion, when the General Junot lived in Lisbon in a luxurious way along with his officials. Junot settled in a big house in Chiado, not far from our school, and his officials settled into Lisbon middle-class families requesting board, lodging and laundry service. What a lifestyle! “Sair à francesa”: the French leave is a stealthy leave. No goodbyes, no need for permission. During the 18th century, in France, it was well received to leave a party or a social event without saying goodbye. But why? Well, it was considered indelicate to interrupt other guests during their conversation just to say goodbye! Times changed! “Trabalhar como um galego” means to work hard. During the 18th century, Galicia was a very poor area and a lot of people came to Portugal searching for a job. They would usually do the hardest jobs, hence its usage! Today it is not very common, “Trabalhar como um mouro” being more popular. 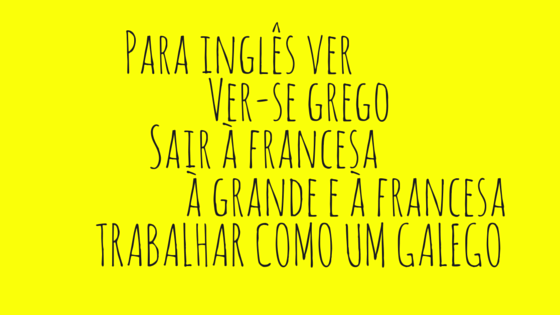 “Ver-se grego”: struggling a lot with something, having difficulties accomplishing a given task. This expression refers back to mediaeval period when latin was the main language spoken and Greek was seen as a difficulty by translators and transcribers. They used to write this note on the documents: “It’s greek, cannot read it”. “Para inglês ver” used to describe something made only for appearances. There are many versions of the story but this expression most likely owes its origin to 1810 when British and Portuguese signed a convention about the slavery trade. It seems that Portugal, under a strong British diplomatic pressure, put down on paper some laws. But the laws were not followed and the trade did not stop...they were just " for the English to see" and calm down!